When it comes to Michael Jackson parties, we say, "don't stop til you get enough." 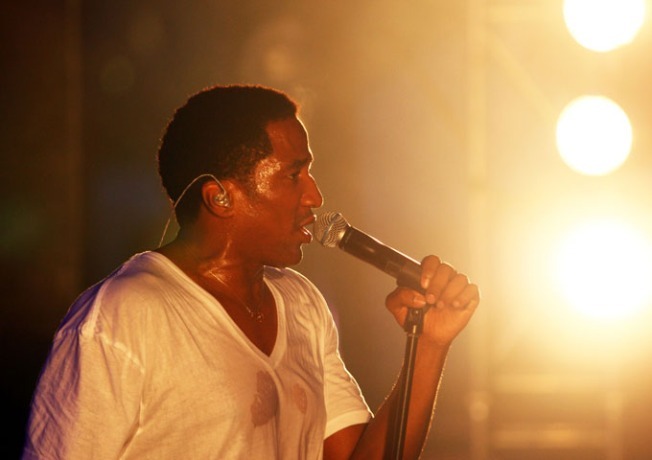 Q-Tip performs on stage during the 2009 All Points West Music & Arts Festival at Liberty State Park in Jersey City, New Jersey. In the months since Michael Jackson’s passing, most people have revealed themselves as freakish MJ fans. Now, there have always been stars that waved the Michael flag; just check the satiny pop-lockin’ of Ginuwine, the dynamic athleticism of song-and-dance man Usher, or the easy Pop-&-B melodies of Ne-Yo. But one of the more random Jackson acolytes is hip-hop MC and former A Tribe Called Quest frontman Q-Tip. While he did build his single “Move” around a nearly indiscernible sample of The Jackson 5’s “Dancing Machine,” Q-Tip is mostly known for fusing obscure jazz riffs with sunny, soulful hip hop. Although lately he has been peppering his live sets with lovingly lavish Jackson covers. But who knew his love for Mike ran so deep? Well, on August 29th, everyone will. This Saturday he’s mounting “Long Live The King! A Birthday Celebration for Michael Jackson,” a mammoth tribute in honor of the late pop monarch’s 51st birthday. It all goes down at the Nokia Theatre Times Square. ‘Tip will man the wheels of steel and promises to blow minds with a cache of unreleased Michael remixes and rare footage of the singer from both his Motown and Sony years. He’s also roped in fellow Grammy Award-winning DJ, producer, and artist Mark Ronson to furnish some tunes. Of course, you know Mark Ronson as the dapper Brit who struck pop pay dirt when he married the velvety rhythms of The Dap Kings to Amy Winehouse’s potty-mouth soul on her acclaimed album, "Back To Black." Hip-hop and house music selector DJ Spinna, who is known for moving feets at legendary tribute parties for Jackson, Prince, Stevie Wonder and more, will also crowd the booth. With Q-Tip’s turntable finesse, Mark Ronson’s ability to rejuvenate old-timey soul, and Spinna’s many rides at the tribute party rodeo (and his largely flawless body-rockin’ skills), this won’t be one of those cheddar-laden, fedoras and flood socks, crotch-clutching fests. These fellas have the credentials to put on a party that truly captures Michael Jackson’s legacy: good music and great memories. 16+, 10 p.m., Sat. August 29.